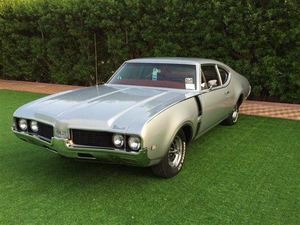 1969 Oldsmobile Cutlass 442, one of only 2475 Sport Coupes produced. This is a matching numbers, air conditioned and power steering 442 with the original 400/325hp and Turbo 400 Auto. The car was restored a few years ago in America and imported into Kuwait last year. For a near fifty year old car she presents very well but there a few bubbles appearing at the bottom of the quarter panels plus a few marks on the bright work and moulds.